With the Narendra Modi government extending the facility of hiring workers on fixed-term employment to all sectors, trade unions are demanding a rollback of the provision which they say will “destroy” the labour sector. Finance Minister Arun Jaitley in his budget speech this year had announced extending the facility of fixed-term employment to all sectors. The provision thus far was applicable only in the apparel manufacturing sector. In pursuance of the announcement, the Ministry of Labour and Employment on March 16 notified amending the Industrial Establishment (Standing Order) 1946. As per the Gazette Notification, the words “fixed-term employment in apparel manufacturing sector” have been replaced by “fixed-term employment”, thereby extending the facility to all sectors. The highly controversial new rules also provide that a temporary workman can be terminated without being given any notice of termination. -No workman employed on fixed-term employment basis as a result of non-renewal of contract or employment or on the expiry of such contract period without it being renewed, shall be entitled to any notice or pay in lieu thereof, if his services are terminated. The rules define A “fixed-term employment” workman as one who has been engaged on the basis of a written contract of employment for a fixed period. Incidentally the Gazette Notification came a day after central trade unions including the CPI (M) affiliated CITU and the Congress’ INTUC on March 15 protested over Modi government “dismantling labour laws designed to completely casualise employment conditions”. While the Centre’s ruling BJP has cited “ease of doing business” in justifying the new rules, trade unions say the provisions rob workmen their basic rights and will eventually destroy the labour sector and the economy. Industry body FICCI too has backed the move saying it will “trigger job creation”. The Rashtriya Swayamsevak Sangh's labour wing, the Bharatiya Mazdoor Sangh (BMS) demanded immediate withdrawal of the notification saying“hire and fire will become the legalised rule in the labour sector”. “Fixed-term is a new system that replaces the middle man viz. contractor in a contract employment. There will not be any permanent relationship between worker and industry. Creating workers without permanent commitment or relationship with the industry, will be a hazard for industrial growth,” said BMS President C K Saji Narayanan. BMS said Jaitley violated the ILO convention 144 on Trade Union Consultation which was ratified by the Indian Parliament, when he unilaterally declared that the fixed-term employment will be implemented. “The important amendment has been brought about by an executive order, without the matter being sent to parliament or being subjected to the scrutiny of a Parliamentary Standing Committee on Labour,” said Narayanan. “This is a backdoor method of Bureaucrats taking up the legislative power enjoyed by the parliament on matters of National importance. The amendment is brought about under pressure from a powerful Industrial lobby,” he added. The Atal Bihari Vajpayee led NDA government had first allowed hiring fixed-term workers in 2003. It was subsequently scrapped in 2007 by the Congress led UPA in 2007 following intense protest by trade unions. After coming to power, the Modi government in April 2015 again mooted the concept by issuing draft rules for amending the Industrial Establishment (Standing Order). But the move was deferred following opposition from trade unions. Trade unions now say collective movement is imperative to thwart the Modi government’s sinister designs. “This is a death knell for labour sector in the country. The pro-corporate Modi government has continued its onslaught on labour. Unless there is a massive movement this will not stop. The need of the hour is collective resistance from all irrespective of their political affiliations,” said an INTUC functionary. He said efforts are on to make all the trade unions including the BMS to meet and discuss the roadmap for taking on the Modi government over the issue. CITU general secretary Tapan Sen said intense movement was the only recourse. “We have been consistently resisting this government’s continuous bid to destroy the labour sector. But they are hell bent. Through this notification they have now destroyed the concept of permanent employment. “They want only contractual labour with no rights or protection whatsoever,” said Sen adding that TUs will be meeting soon to chalk out their plan of action. While the BMS had refrained from joining other central trade unions during their recent agitations, it is now “open” to discuss the issue and may join them in protests. “We have ideological differences with other trade unions but workers’ welfare is paramount. We are open for discussion with them to explore ways to prevent this onslaught,” said a BMS functionary. 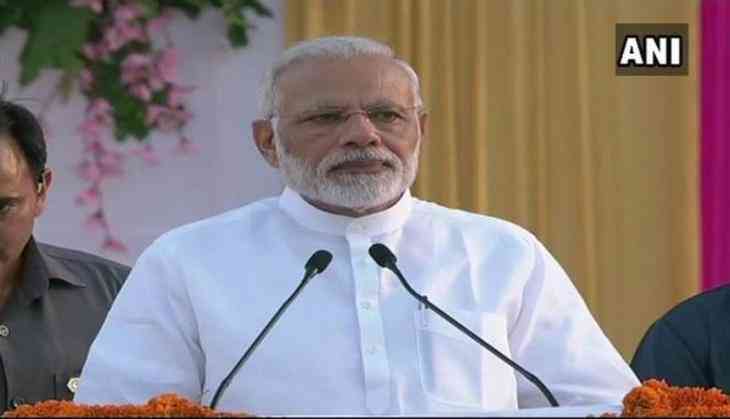 New Trade Union Initiative (NTUI) General Secretary Gautam Mody dubbed the Modi government’s economic policy as “disastrous” and called upon all trade unions to build up a movement. “This is terrible move which takes away implicit rights of the workers and provides no protection for unfair labour practices. Industry must invest in long term employment for skilling workers so that industry innovates and the economy is competitive. The Modi government is presiding over a process of deindustrialisation and deskilling,” said Mody. “If the UPA had terrible economic policy, the NDA has disastrous economic policy. Under UPA roughly 5 lakh new workers got jobs annually. Under the Modi regime, it has now come to down just one lakh,” he added. “The government is dismantling labour laws in the name of ‘ease of doing business’. It is is nothing but a ploy to make the rich richer and poor and poorer. All TUs needs to collectively resist this and we are working on that,” Mody further said.